November 24, 2010 - Transportation Security Administration (TSA) Administrator John S. Pistole announced that the agency is taking additional steps to streamline security screening for U.S. air carrier pilots. Pistole directed TSA to review existing protocols for pilots after he was appointed to lead the agency this summer. ?Pilots are trusted partners who ensure the safety of millions of passengers flying every day,? said TSA Administrator John S. Pistole. ?Allowing these uniformed pilots, whose identity has been verified, to go through expedited screening at the checkpoint just makes for smart security and an efficient use of our resources.? ?We appreciate TSA?s dedication to safeguarding the flying public and their acknowledgement of airline pilots as trusted security partners,? said Capt. John Prater, president of the Air Line Pilots Association, Int?l (ALPA). ?An enhanced screening process for airline pilots will provide a higher level of security while moving them efficiently through checkpoints. As a result, airline pilots will be treated in a manner that reflects their trustworthiness and responsibility as professionals.? ?Establishing a secure system to positively identify and verify the employment status of uniformed pilots is a common sense, risk-based approach that allows TSA to dedicate more resources to unknown threats,? said Capt. Paul Onorato, President of the Coalition of Airline Pilots Associations (CAPA). 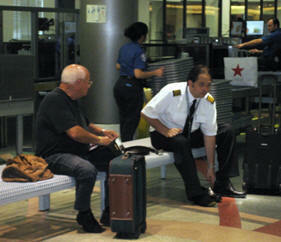 ?This is another example of pilots working with TSA to help ensure the safety and security of the traveling public.? ?The US Airline Pilots Association appreciates the TSA?s willingness to work with us to find a solution that recognizes what an important asset pilots are to the security process,? stated USAPA President Mike Cleary. ?We are eager to continue the conversation with Administrator Pistole and our fellow pilots? unions to ensure that these new protocols are implemented properly and in the very near future.? ?I am glad that the TSA is working with pilots as the trusted partners they are in this important security effort,? said Captain Chesley ?Sully? Sullenberger. ?I look forward to continuing to work with them to reach our common goal of making air travel as safe as possible for the American public.? ?We view this as a very welcome policy change,? said Gregg Overman, Communications Director for the Allied Pilots Association. TSA is working closely with pilots to expedite their security screening by verifying their identity and employment at the checkpoint at airports nationwide, modeled after a successful pilot program that is currently operational at three airports. While a nationwide sterile area access system for pilots is being phased in, pilots traveling in uniform on airline business will see immediate modifications to their checkpoint screening process due to their trusted status. Eligible pilots must work for a U.S. carrier, be traveling in uniform, and on airline business. Pilots will enter the secure area after presenting their airline-issued identification and another form of identification to Transportation Security Officers (TSOs). TSOs will check credentials against a secure, real-time airline flight deck crewmember database, which includes a picture and other information to verify the individual?s employment status. Flight deck crewmembers who utilize this program will also be subject to random screening and other layers of security. In conjunction with the Air Line Pilots Association, Int?l, TSA tested a sterile area access system called CrewPASS in 2008 and 2009. In June 2009, TSA announced Crew Personnel Advanced Screening System (CrewPASS) would continue to operate at the test sites: Baltimore-Washington Thurgood Marshall International, Pittsburgh International, and Columbia (S.C.) Metropolitan airports. The Air Line Pilots Association, Int?l (ALPA), has welcomed the Transportation Security Administration (TSA) announcement of expedited screening for airline pilots as important action to move the nation toward a threat-based strategy that focuses security resources where the risk is highest and away from a one-size-fits-all approach. ?Airline pilots are trusted security partners, given the level of background checks they must satisfy as part of employment and the responsibility they have for the safe operation of the flight,? said Capt. John Prater, ALPA?s president. ?We appreciate the TSA?s recognition of this partnership with new procedures that will provide a higher level of security throughout the system while moving pilots efficiently through screening checkpoints.? ALPA has long advocated a threat-based approach to aviation security that focuses limited screening resources on individuals about whom little or nothing is known while accurately identifying trusted travelers such as airline pilots and allowing them to be screened appropriately. ALPA proposed the creation of a highly secure and effective security screening system that would quickly and accurately verify the identity and employment status of active airline pilots. As a result, ALPA?s Crew Personnel Advanced Screening System (CrewPASS) program would identify individual pilots as trusted and, as a result, enhance the overall security of air travel and reduce passenger delays. In today?s announcement, the TSA acknowledged ALPA for developing the CrewPASS concept and committed to phasing in CrewPASS nationally. The CrewPASS system is currently operating at Baltimore-Washington Thurgood Marshall International, Pittsburgh International, and Columbia Metropolitan airports. ?Airline pilots across this country are gratified by TSA?s announcement of new procedures and its commitment to implement the CrewPASS enhanced pilot screening program nationwide as critical steps to making our air transportation system more secure for everyone,? concluded Prater.